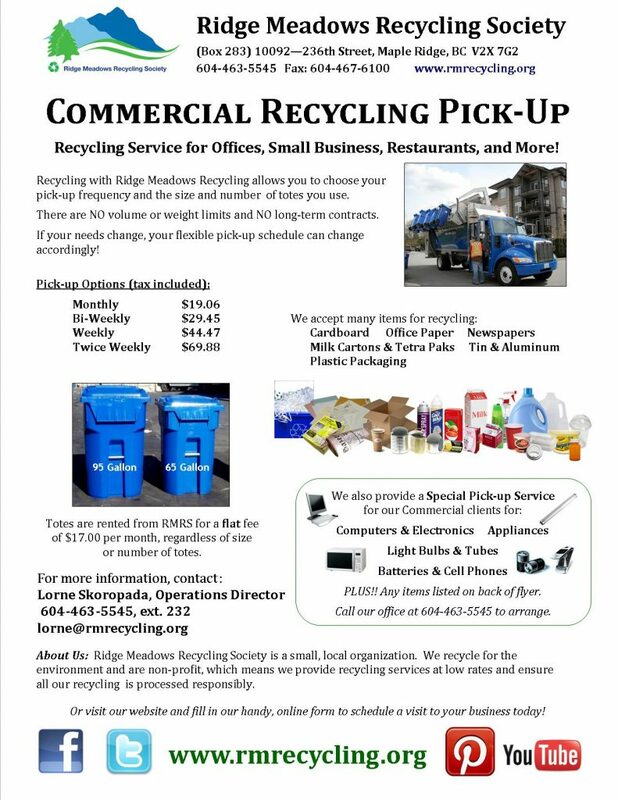 Ridge Meadows Recycling offers a variety of recycling services for offices, restaurants, small businesses, and more. Download the Commercial Recycling Flyer. Recycling with RMRS allows you to specify the type of material you have to recycle and offers the flexibility to choose your pick-up frequency and the size and number of recycling totes you use. There are no volume weight limits and the contract can be adjusted at any time without penalty or extra charge. *Click to download the RMRS A to Z List, a list of items accepted at the Recycling Depot. Do you have old electronics (computers, monitors, photocopiers, etc.) or an old appliance (fridge, dishwasher) taking up space at your office? Learn more about our Large Item Pickup Service! Our customized service fits into any budget and meets your company’s individual needs. Call 604-463-5545 or fill out the form below to learn how you can lower your bottom line and avoid costly fees by diverting recyclables from your garbage collection bins.